Originally featured in the Omaha World-Herald on March 15, 2014. Library membership for South Omaha residents was at one time rather exclusive. In 1889, A.M. Winebrener presented an idea to establish a subscription library to the citizens of South Omaha. He received some book donations and the backing of some of the area’s respected business owners, and created a library association with an annual $2 membership fee. Finding a permanent home for the library’s collection proved to be a much greater challenge. It moved from place to place, and financial troubles forced the library’s board to box and store books several times. By 1901, steel tycoon Andrew Carnegie’s significant financial support for public libraries was well known, and with the help of Congressman David A. Mercer, the City of South Omaha requested and was granted $50,000 for the construction of a new library, provided that the city acquire a suitable site. A three-story stone structure was built at 23rd and M Streets and opened in January 1905. South Omaha was annexed by the City of Omaha in 1915 and its library became the South Omaha branch of the Omaha Public Library. The location served its community well, but the years took a toll on the building, and irreparable damages and lack of space motivated the library board to replace it with a new building on the same site in 1954. The new building was designed by Leo A. Daly architects and was considered contemporary, with only one story and floor-to-ceiling glass along the front wall to maximize natural light. 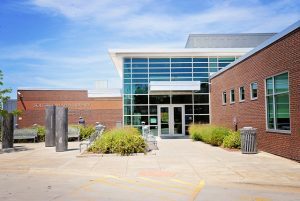 In July 1999, the City of Omaha and Metropolitan Community College announced a plan to build a new library in South Omaha with twice the capacity of the location at 23rd and M Streets. While there was little disagreement over the need for a larger library with more parking, the decision to move the location to 28th and Q Streets was met with mixed reviews from community members concerned about the new site’s accessibility and safety. After years of debate and tight budgets, the joint-use facility with Metro Community College opened in June 2008. Today, South Omaha Library offers designated areas for teens and children, and the largest collection of Spanish language materials in the system, as well as featured artwork by local artists. Unique programming includes bilingual story times, English as a Second Language and citizenship classes, and GED preparation classes.